Restaurant in Oaxaca is as Authentic as They Get. It’ll cost María Sara and her husband Hilarino about $7,000 USD to get electricity for their tiny, roadside eatery, located about an hour outside of the City of Oaxaca. It’s feasible only if they can get some of their neighbors to chip in. But that would detract from the allure of their restaurant: fresh meats delivered to the premises daily and kept cool in an insulated box; hours of operation governed by nature; no stove or oven, nor subtle din of an electric fridge; and no TV revisiting Mexico’s last soccer triumph. El Tigre is about the last vestige of Old Mexico you’ll encounter on a visit to Oaxaca, while at the same time as comfortable, accommodating, and safe for North American gastrointestinal tracts as you’ll find in the finest white linen restaurants in the downtown core. Sure, the wood-burning hearth over which all of their daily offerings are prepared, produces distracting smoke from time to time. And it’s doubtful that the blocks of ice cooling the Coke, Fanta and Corona will keep the beverages as cold as most are accustomed. But save and except for these shortcomings, if you’re heading to Mitla, or out towards Hierve el Agua, a visit to El Tigre is not to be missed. You’ll be warmly greeted by María Sara and her daughter-in-law Alma. Conceivably Hilarino will be there as well. He runs the mezcal operation alongside the restaurant, the implication being that if you order mezcal, it’s on the house. But you’re stopping for the food and the open air ambience and basically nothing more. There’s no menu, so you’d better either have a minimal knowledge of Spanish, or read on and take notes. Each morning María cooks up a different stew, be it beef in green sauce, pork in red, or something similar. Otherwise the standard choices available every day are quite simple: grilled chorizo (Oaxacan sausage); a plate of cecina (sliced pork lightly dusted with chili); tasajo (thinly sliced beef); eggs, either scrambled alone or with chorizo, or fried; quesadillas; and memelitas. María is used to this writer bringing by North American tourists, who have often commented that it was the best meal they’ve had in Oaxaca. 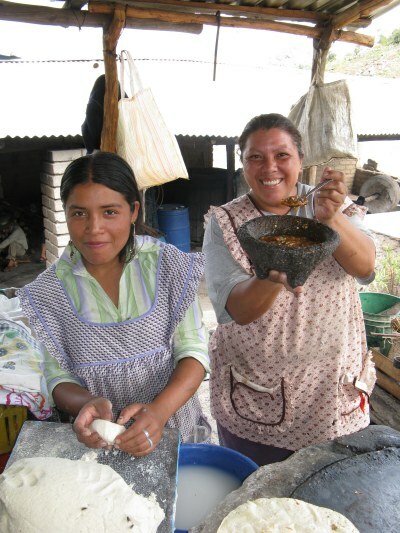 You can ask for anything to be cooked on the comal, over open flame, sans lard, oil or butter. The accompaniments are sliced tomato and onion (disinfected), boiled black beans, and freshly made salsa with garlic, chili, tomato, and little more, served hot off the grill in its molcajete, the pestle and mortar used in preparation. You’ll generally see a pot of simmering corn kernels being softened and readied for the next day’s grinding into a masa for making tortillas. And yes, of course the tortillas, made with hand-ground cornmeal and prepared on the comal before your eyes complement every order. Since 1994 El Tigre has been serving the surrounding communities, the odd visitor en route to and from to Hierve el Agua, and those in transit between Oaxaca and the district known as the Mixe. The main attraction for many Mexicans is the mezcal produced on site by Hilarino, using the age old traditional techniques of his grandparents and their forebears. But for those who yearn for a taste of down-to-earth, unadulterated southern Mexico, El Tigre is a must --- uniquely Oaxacan, and as fresh and flavorful as you can get. El Tigre is open 7 days from morning until 7 pm, Sundays until 2. It’s along highway 190, perhaps a 15 minute drive beyond Mitla, on the left hand side about a half mile before you get to the San Lorenzo Albarradas cutoff which takes you to the bubbling springs. Alvin Starkman has a masters in anthropology and law degree from Osgoode Hall Law School. Now a resident of Oaxaca, Alvin writes, takes tours to the sights, and owns Casa Machaya Oaxaca Bed & Breakfast, a unique Oaxaca bed and breakfast experience which combines the comfort and service of a large downtown Oaxaca hotel, with the personal touch and quaintness of a country inn. Alvin consistently receives cudos from his touring clients after a visit to El Tigre.